They say the journey of a thousand miles begins with one step, but sometimes taking that first step can be hard. As part of our 2017 POPSUGAR Insights Auto Report, we surveyed over 1,200 US millennial female in-market auto shoppers to better understand their perspective on shopping for their next vehicle. We learned that 3 in 10 millennial women who have decided to purchase a new vehicle are struggling with taking the first step. That's not the case for everyone, however, and for nearly one half of millennial women, the first step includes conducting an online search via Google or another search engine (47%) to kick-start the process. 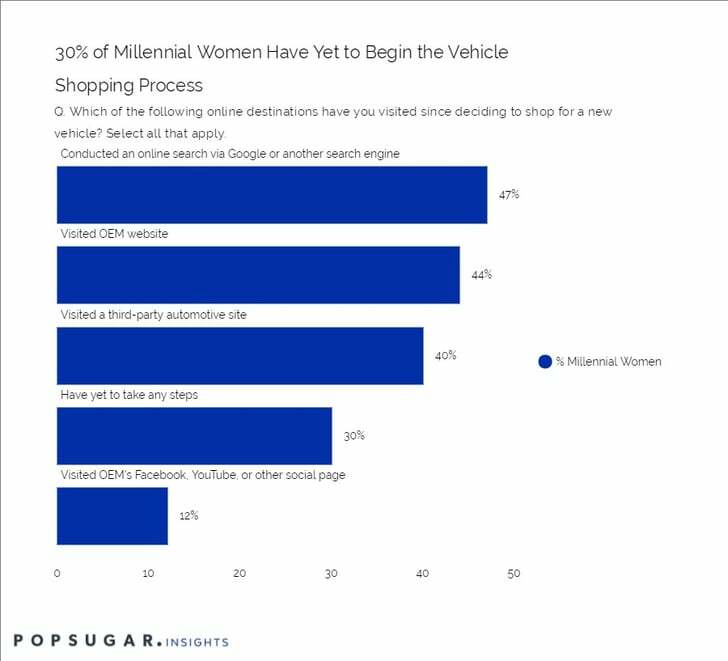 Other popular steps in the car shopping process for millennial women include visiting an original equipment manufacturer's (OEM) website (44%), visiting a third-party automotive site (40%), or visiting an OEM's Facebook, YouTube, or other social profile page.